For the sauce, add the butter and brown sugar to a pan over medium heat. Stir constantly, until the sugar has melted. Whisk in the cream and armagnac and boil until the mixture is the desired thickness. For the pancakes, sift the flour, sugar, baking powder, baking soda, and salt together. Melt 2 tablespoons of butter in the microwave until it's just barely melted (don't let it boil). Measure the yogurt out into a small bowl. Whisk the egg yolk into the butter. Whisk the egg white into the yogurt. Pour the egg yolk and butter mixture into the yogurt mixture and whisk until evenly combined. Pour the wet ingredients into the dry ingredients and fold together until there are no large lumps of flour remaining, but be careful not to over mix, or your pancakes will end up tough. Heat a skillet over medium-low heat until hot and then use an oil soaked paper towel to spread a thin layer of oil onto the entire surface of the pan. Add the pancake batter to the pan and then immediately top the batter with slices of bananas. Flip the pancakes over when the edges are no longer glossy. Repeat with the remaining batter. 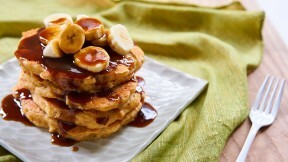 Serve the pancakes with the sauce and garnish with additional bananas if desired.